As we come closer to the end of 2018, I thank God for all He has given us. With the blessings, even hardships we’ve faced, we came through (as did the pets) the way the Lord intended. As of this writing, end of October, this year has been one of our best! Looking back on the year, finances were a bit on the lean side toward the end of February and beginning of March. The momentum picked up when a small grant was received from the Ohio Pet Fund to help us over the hump until we received another small grant from the Doris Day Animal Foundation. 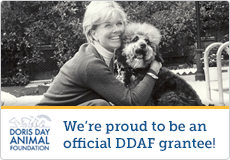 The DDAF helps so many animal organizations nationwide that we feel fortunate to have been one of its grantees. Without The Ohio Pet Fund and The Doris Day Animal Foundation to help, our neuter/spay program would have faced interruption of services and with this happening, the animals would have been in jeopardy, increasing the pet population to much higher numbers in our community. We are so appreciative that help came in the time of need to help the animals and the people who love them. In addition to two grants, we had a successful fundraiser with “Autumn Leaves”. We are grateful for the support of this event every year. It’s amazing how so many people come together to help in this endeavor. I’d also like to thank one of our advisory board members Ann Kallal for her artwork for our much needed and appreciated thank you notes. She has given us a collection of cards with the faces of pets we have helped over the years. For this year, a very special card has many faces of the pets we have helped since the beginning. Even though they are too many to place on a card, we did select the many faces that stand out. Ann placed each pet face close to or on a leaf…so appropriate for our “Autumn Leaves” fundraiser. We are calling our card, quite simply, “Thankful Faces”. By December 31, hopefully, our 2018-19 PUPS Digest will be out. To be one of the first ones to receive a copy of the PUPS Digest, here is a special offer: send a donation of any amount here on our site link or mail to our regular address: Pets Uniting People Society (P.U.P.S. ), Box 49, Tremont City, OH 45372. A P.U.P.S. membership drive is in the works. We have wanted to begin one many times, but didn’t have the volunteers to work it. Now, we feel we can move forward. Look for a Membership Drive to take place Spring 2019. If you would like to learn more about our neuter/spay program, go to our link on this site. Hopefully, we will be adding frequent news and information throughout 2019. Come back and visit soon! On behalf of all of us at Pets Uniting People Society (P.U.P.S.) – have a Happy Thanksgiving, Merry Christmas, and a blessed New Year!